The most outstanding symbol of the Ottoman sultan’s authority was his imperial tuğra (cipher), which was affixed to all official documents, indicating fermans, vakfiyes and correspondence; it was also carved on his seals and stamped on coins minted during his reign. Each sultan chose his personal tuğra immediately after his accession and used the same format throughout his life. Since the word tuğra is of Oghuz Turkish origin (tuğrağ), it is thought that the tradition of validating documents with the ruler’s name or signature was practiced as early as the ninth or tenth century and passed on to later Turkish dynasties, including the Seljuks and the Mamluks. There have been many speculations on the shape of tuğra. Some believed it originated from "tugri", a mythical hawk, a totem sign with Oghuz Turks. Islamic Encyclopedia defines it as derived from "tuğ", the traditional horse tail signs of Turkic peoples. Although the use of a tuğra was an ancient practice, the type devised by the Ottomans was unique and remained unchanged for some six hundreds years. The Ottoman tuğra has four basic components: the sere, the lower potion with stacked letters bearing the name of the owner; the tuğ, three vertical projections at the top joined by S-shaped strokes; the beyze, two concentric circular extensions on the left, the inner one called küçük (small) beyze and the outer büyük (large) beyze; and the kol, a curved stroke extending from the sere into the beyze. Sweeping downwards from each of the three shafts in an S-flourish are what is known as zülfe (i.e., pendant flourish). Some sultanic tuğras from the early period display a vowel sign over the each of the shafts resembling a small vav, or apostrophe, called a vasla. The base portion symbolizes the Ottoman throne and above it the sultan’s name is coupled with the motto “Ever victorious”. The earliest Ottoman tuğra belongs to Orhan Gazi dated 1324 and states in a simple form, "Orhan bin Osman" (Orhan son of Osman). During the reign of Bayezid I. the word “Han” (Khan: the ruler) appeared after the father’s first name and his signature became "Beyazid bin Murad Han". In the reign of Sultan Murad II., the word “muzaffer” which means victorious was added and his signature became "Murad bin Mehmed Han muzaffer". After Mehmed II. the motto became “el-Muzaffer daima” (the ever victorious) and his signature became "Mehmed bin Murad Han muzaffer daima". Starting with Sultan Selim I, the word “Şah” was inserted after “Han”. Following the reign of Ahmed III., the use of the word “Şah” was abandoned. The Ottoman tuğra was used as the coat of arms of the dynasty after the eighteen century and was employed on such official items as postage stamps, flags, ships, coins and government buildings. The format of the tuğra was also later applied to writing Koranic verses, prayers and names of individuals. Synonymous with tuğra, the words tevki from the Arabic denoting ‘signature’ and nişan from the Persian were also employed in the text of the ferman. Expressions such as tevki’-i humayun, tevki-i refi, and nişan-i serif alisan-i sultani all refer to the tuğra. Similarly, alamet-i serife appearing in fermans, diplomas, patents, and similar document also signify the sultanic tuğra. The person charged with drawing the sultanic tuğra was called tuğrâi, tuğrakeş, tevk’-’i or nişancı. The sultanic tuğra, which in the beginning was drawn in black ink, was first delineated in gold ink during the reign of Mehmed II. Under Beyazid II, the fields of the ellipse were subject to illumination. Prominent features of the ornamentation were the application of gold wash and what came to be designated as the Classical style of illumination. 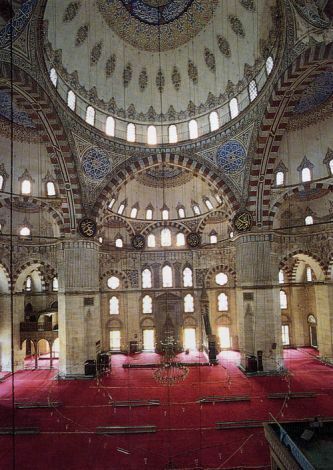 The sultanic tuğras of the 16th century allow us to capture a glimpse of the resplendence of the classical era. The illumination of this period was characterized by the balanced harmony between the color of lapis lazuli and gold; the semi-stylized garden flowers by the chief imperial artist, Nakkaşbaşı Mehmed Çelebi, which achieved renown as “Kara Memi flowers”; the Chinese cloud band; slender curved lanceolate motifs; floral and foliate motifs executed freehand; the scrolling figure or Golden Horn style; and the compositions of interlaced Seljukid wing patterns, all of which can be identified in the illustration of the sultanic tuğras of the day such as the tuğras of Sultans Süleyman I, Selim II and Murad III. The most harmonious use of the basic components appears in the tuğras of Süleyman the magnificent. Toward the end of the 16th century, the field of ornamentation expanded beyond the confines of the sultanic tuğra and assumed a triangular form that rose above it and enclosed it. This form (the tree of life figure) inspired by the cypress tree, survived with a few modifications until the end of the 19th century. The inner field, which was usually ornamented by elements of the Golden Horn style, was in subsequent periods decorated in gold wash and colored gold wash. The spatial intervals in the sultanic tuğra were generally filled by classical illumination, gold wash, scrolling figured, motifs drawn freehand and rarely a diaper pattern. In the 17th century, the lapis lazuli lost its radiance and dot-shaped impressions were added to heighten the brilliance of the ornamentation of the tuğra, and degeneration in the composition can also be detected in the illumination of the sultanic tuğra. Toward the end of the 17th century and up to the early years of the 18th century, Western influence which was intensely experienced can be discerned in the rendering of shaded floral motifs as a modeling technique. Also making their appearance in the illumination of this era are the revival of the curving lanceolate foliate design, the use of the 18th century and continuing into the 19th century, some of the most beautiful specimens of Turkish Rococo ornamentation can be observed in the illumination of the tuğra of Mahmud II. Moreover, the executed form of the tuğra reached the pinnacle of perfection under the hand of tuğrakeş Mustafa Efendi. In the late period, the illumination of the tuğra chiefly consists in such elements as the imperial coat of arms executed in two colors of gold (green and yellow), the star and the crescent motif, the sunburst pattern and Rococo flowers and borders. The sultanic tuğras were not always illuminated but occasionally were left plain.